4150 North Knox Avenue is a 40,700 square foot, Class A industrial building situated on 1.6 acres. The building features all of the state-of-the-art features of new concrete tilt-up construction: 30' clear height; ESFR; 55' by 55' bay spacing; four dock-high loading doors; LED lighting and ample power. The building is designed to accommodate either a full building user or multi-tenancy. The property is located off of West Montrose Avenue and 1/4 mile from I-90/I-94 Expressway entrances. Situated in the Portage Park section of Chicago, the property is two blocks from the Chicago Transit Authority light rail and Metra commuter rail stations. The site is approximately eight miles to Chicago's downtown Loop area and seven miles to O'Hare International Airport. 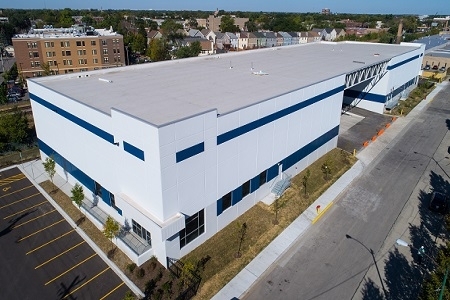 This is a true infill site that offers an ideal location and rare new state-of-the-art space for "last mile" industrial distribution tenants to service downtown Chicago. EverWest acquired 4150 North Knox Avenue on behalf of an institutional separate account with a Fortune 500 telecommunication company in February 2016.